The classical TEP technique is the laparoscopic technique considered closest to ideal for inguinal hernia repair, but the technique has several drawbacks such as limited space for dissection and mesh placement, restricted port placement, a low tolerance of accidental pneumoperitoneum, and difficulty in teaching and learning the technique. These disadvantages may explain the low implementation of the technique outside the circle of experts. We describe an extended-view modification, the eTEP technique, which overcomes several of these drawbacks. The eTEP technique is based on the premise that the extraperitoneal space can be reached from almost anywhere in the anterior abdominal wall. The eTEP approach can quickly and easily create an extraperitoneal space, enlarge the surgical field, provide a flexible port setup adaptable to many situations, allow unencumbered parietalization of the cord structures (proximal dissection of the sac and peritoneum), ease the management of the distal sac in cases of large inguinoscrotal hernias, and improve tolerance of pneumoperitoneum, which is a common complication. 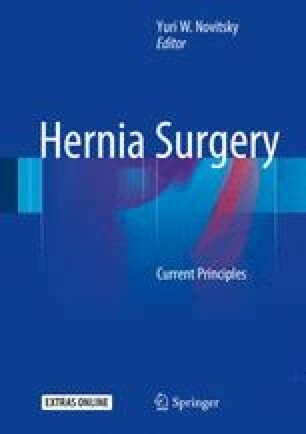 We believe that the eTEP technique has a place in the armamentarium of the hernia surgeon. Residents and surgeons in training will find this technique easier to master. The eTEP can expand the traditional indications of the extraperitoneal approach to patients with difficult body habitus, a short umbilicus-pubis distance, and previous pelvic surgery, and as experience is gained, the indications for traditional TEP can expand to more complex cases. The online version of this chapter (doi: 10.1007/978-3-319-27470-6_45) contains supplementary material, which is available to authorized users.